Explore how hand-knotted carpets as indicators of wealth and good taste have furnished the most important and the most humble dwellings. Discover their use in palaces and places of worship, in the tents of nomadic people and even buried with the dead. Displayed in great museums and sold in department stores, hand-knotted carpets can be items of great luxury or every-day furnishings. Jennifer Wearden was Senior Curator of Textiles in the V&A's Department of Furniture, Textiles & Fashion until 2005 and is now an Honorary Research Fellow. With experience of the textile industry in Lancashire, and 28 years working with the textiles collections in the V&A, she now uses her knowledge to devise and deliver successful courses. 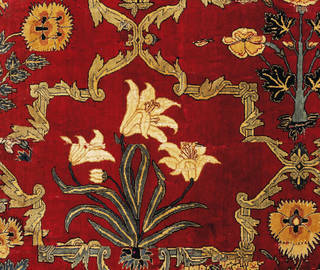 Learn about carpets from the Muslim world of Turkey, Egypt, Spain, Iran, Mughal India, the Caucasus and Central Asia and see how the technique used to produce these expensive floor coverings was copied in England to meet the needs of the nobility and in France to enhance the prestige of the king. You will step into the fascinating world of hand-knotted carpets and study how they have been designed, made, used and traded from the Middle Ages to the present day.